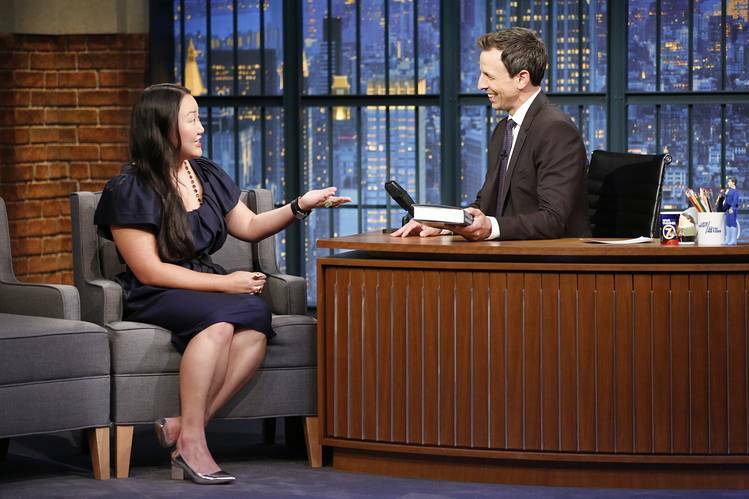 When Hanya Yanagihara was asked to talk about her 736-page book“A Little Life” on “Late Night With Seth Meyers,” she assumed the invitation was a joke. “I just thought they were high,” the author said. Her novel has dark themes of sexual violence, a complex lineup of characters, shifting perspectives and nonlinear storytelling—elements she considers “a huge turnoff” even for committed readers. “If you told someone in late night, ‘I’d like to send on someone with zero TV experience to talk about a literary book for 10 minutes’ it sounds like a really bad idea,” Ms. Yanagihara said. But she went on the show and in the following week, sales of “A Little Life” rose by 54% according to Nielsen BookScan. 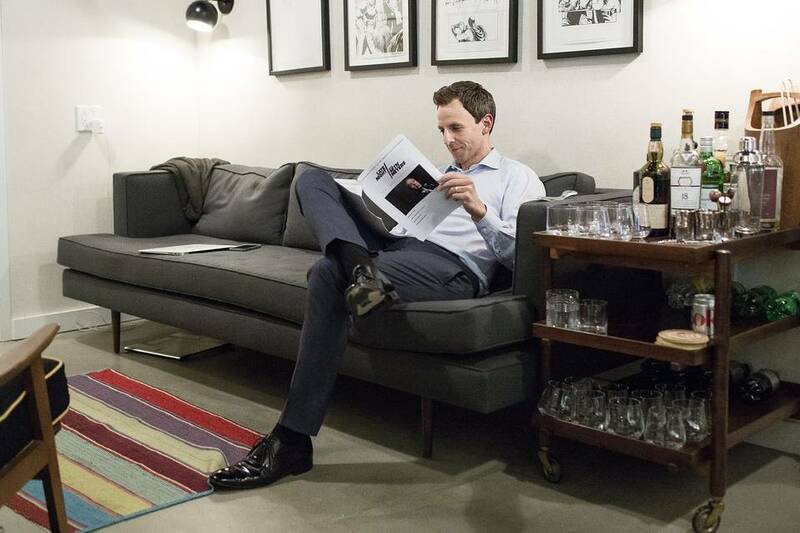 “Late Night With Seth Meyers” has become a haven for writers, particularly novelists, with the host welcoming more than a dozen authors in the past year. 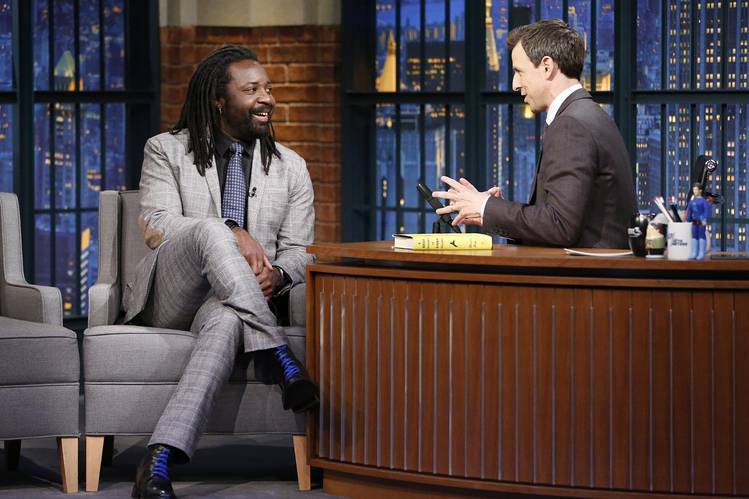 Mr. Meyers has interviewed Joshua Ferrisand Marlon James as well as seasoned best-sellers like George R.R. Martin and Stephen King. The author interviews are one way Mr. Meyers, a 41-year-old veteran of “Saturday Night Live,” is establishing his identity as a late-night host. While the genre relies ever more on celebrity stunts and viral hits, Mr. Meyers has tacked in a different direction from rivals including Jimmy Fallon, another “Saturday Night Live” graduate, whom he succeeded as “Late Night” host 16 months ago. Appearances often translate into a bump in readership. Linda Fairstein, a former prosecutor who now writes crime fiction, saw sales of her novel “Terminal City” shoot up 500% the week after discussing the book on the show. Iranian author Azar Nafisi and Canadian sportswriter Jonah Keri saw more modest increases in sales of their works after “Late Night” interviews. Judy Blume and Junot Diaz are booked to appear in coming months. With Mr. Meyers behind the desk, the show has morphed into something of an intellectual salon, with authors and biting political commentary as well as celebrities. Mr. Meyers has jokes, too. They’re just different. Where Mr. Fallon, now host of “The Tonight Show,” engages guests in Pictionary and lip-sync battles, Mr. Meyers constructs life-size sets of New Yorker cartoons and has costumed staff members expressively deliver the captions. Then the magazine’s editor, David Remnick—a frequent guest—comes out to chat about the jokes and analyze why they are funny. Mr. Meyers came up with the New Yorker bit “five minutes after I got offered the show,” he said. Late-night peer Jimmy Kimmel has a recurring segment where celebrities read mean tweets about themselves. On “Late Night With Seth Meyers,” members of the crew pretend to be poet laureates and declaim stanzas. Although the first poetry segment fell short of 5,200 hits on YouTube, the cast proceeded with a second installment. Growing up in New Hampshire, Mr. Meyers inherited a love of reading from his mom, who peppers him with recommendations from her book club, he said. Mr. Meyers notes that as the host, he also actually has to read the novel—and assume the audience hasn’t. Sometimes “I’m so excited to talk to someone about this book I’ve read that I forget that there’s no context for it,” he said. Novels seldom make world-wide headlines and few authors, unlike pop stars and actors, have global followings that can drive ratings. Mr. Meyers’s viewers are older and more female than audiences for Messrs. Fallon, Stewart and Colbert. Thus far this year, Mr. Meyers has averaged 1.5 million viewers nightly, according to Nielsen, compared with Mr. Stewart’s 1.3 million. He remains well below Mr. Fallon’s final five months on “Late Night,” which averaged 2.1 million viewers in the same time slot. NBC executives said the number of people watching television shrinks by at least a third by 12:35 a.m. when Mr. Meyers’ show comes on, so ratings for his program shouldn’t be compared with ones for shows that air in earlier time slots, such as Mr. Stewart’s. Mr. Meyers’s “Late Night” drew higher ratings among viewers 18-34 years old than David Letterman’s program during its final run and consistently beats the other programs in its time slot, a network spokesman said. When crafting the mood of a late-night show, “the mandate comes from the interests of the person behind the desk,” said Mike Shoemaker, a producer who worked with Messrs. Meyers and Fallon on “Saturday Night Live” and helped launch both their late-night shows. “Seth has a lot of them.” Those interests include fashion, artists such as Jeff Koons, sports and politics. At a recent rehearsal, staff members huddled on set debating the ethics of states' rights for a commentary the host was to deliver on the Confederate battle flag. Mr. Meyers’s political comedy, delivered with his straight-man persona, retains the edge honed during his eight-year run on “Saturday Night Live.” His new office, down the hall from the SNL studio, has a few reminders of the former gig, including his final Weekend Update card and a photo with frequent “Saturday Night Live” collaborator, Amy Poehler.